Our wooden statue in recycled armor. At the beginning of October we hosted yet another Youth Make event. During the night a lot of different projects were worked on by the kids and staff. 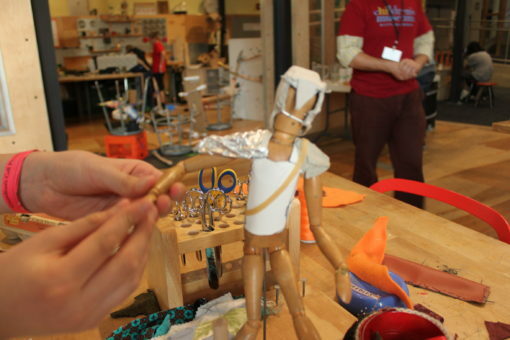 Our wooden sewing model was given a suit of armor for its Halloween costume. There were a couple of sewing projects created during the night. As usual the kids hung out, ate a lot of pizza and made things. 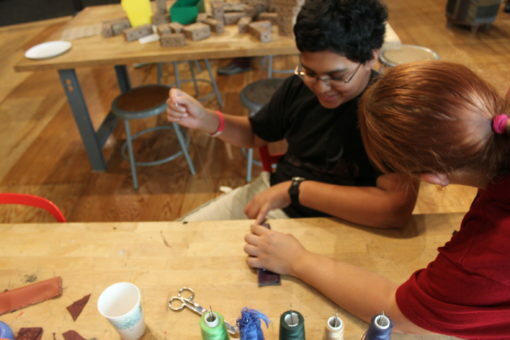 One of the teens sewing with a Teaching Artist. The main theme of the night was chain reactions and ramps. The kids were given a lot of materials and a lot of space in the workshop to build a ramp system for ball to roll around on. Some of the kids tried adding some circuitry into the mix. They wanted to have a switch that the ball would trigger to turn on a light. This idea sort of worked. Another group of kids spent the entire night trying to build a ramp system that utilized two balls and two tracks. The idea was to have the balls weave in and out from each other on the tracks. The two girls who worked on this were really happy when they finally got both balls to make it to the end of the track. The ramps were a really fun activity to host. 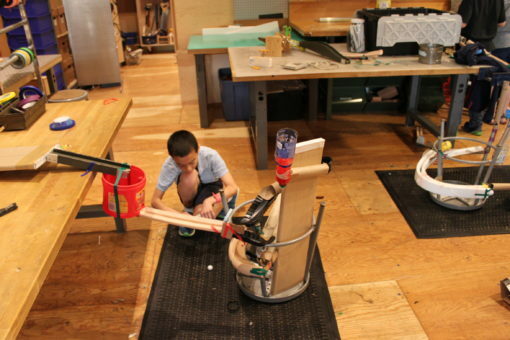 The kids were able to build something from scratch or simply play with a ramp system that already existed. Or, in some cases, fix a ramp system that was broken. The ramps offered a nice, open-ended activity that an older audience can really take advantage of. Josh works on fixing a recycled materials ramp system. Finally, as with all of our previous Youth Make events, an awesome stop-motion animation was created by one of the kids. Daniel spent a majority of his time working on this animation. I really like the level of detail he captured by simply taking a few extra photos of the tiles flipping over. This is a technique I have yet to see someone do with our stop-motion program. Thanks to everyone who attended our October Youth Make event. Please check our Museum calendar for information on upcoming events. 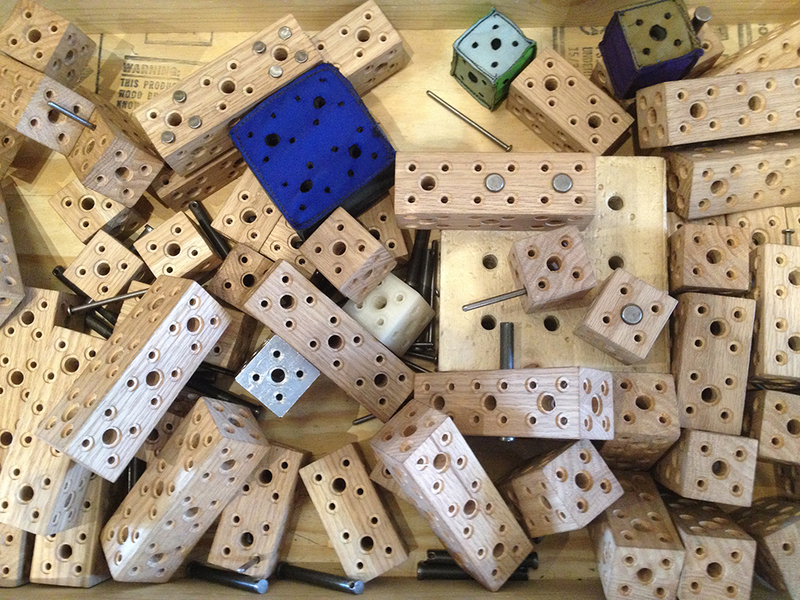 Our next Youth Make will be taking place on November 7th from 5 to 7PM (ages 10+).